Vanhankaupunginlahti is one of Finland’s most well-known and best bird wetlands. The area makes for a great outing destination in all four seasons. A total of 300 different species of birds have been sighted in the area, the most recent new sightings being the dusky warbler (2014) and the common murre (2012). In the 21st century, the area has been used as a nesting ground by 125 species, of which approximately twenty are irregular nesters. The most recent new nesting species are the whooper swan (2014), the Canada goose (2014), the greylag goose (2015) and the white-backed woodpecker (2011–12). In addition to these, the common crane has had a territory in the area in several years. All in all, the area’s wetlands and fields serve as the nesting grounds of approximately 2,500 pairs of birds each year. Vanhankaupunginlahti is a unique bird oasis located right in the middle of Helsinki. 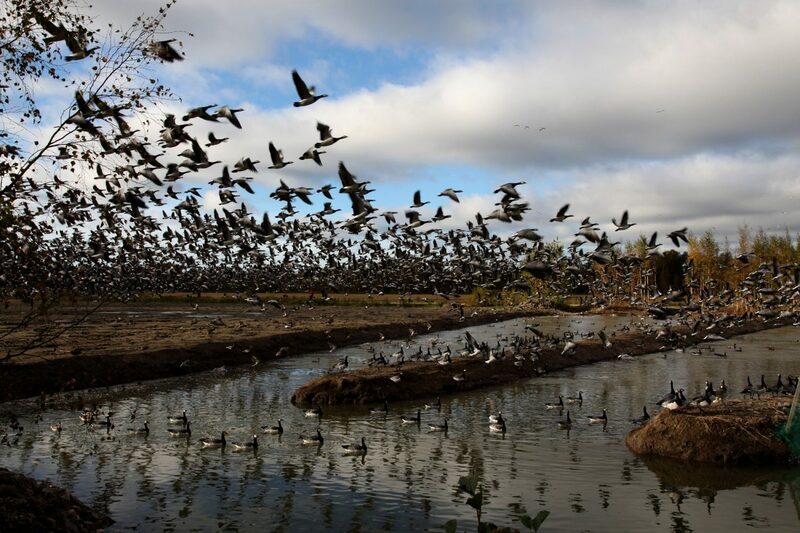 It is part of the network of staging and nesting grounds used by migrating waterfowl in the Western Palearctic zone, stretching from the Arctic areas of Siberia all the way to the vast wetlands of Africa. In the spring and autumn, Vanhankaupunginlahti serves as a place to rest for tens of thousands of migrating birds. Over the decades, this “bird paradise in the middle of the city” has served as the “primary school” of countless new generations of bird watchers. Thanks to its location, Vanhankaupunginlahti is the number one bird-watching destination in Helsinki, not only for those who carry mountains of photography equipment with them, but for weekend hikers as well. The bay’s birdlife is easy to observe from the area’s bird watching towers. The bay’s waterfowl are large, colourful and majestic. Many of the species put on impressive courtship displays, with the dance of the great crested grebe and the head-tossing and creaking of the male common goldeneye being common sights in the spring. Great crested grebes are most commonly sighted off Kivinokka. In recent years, the waters around Hakalanniemi and Lammassaari have been dominated in a very noisy manner by a pair of whooper swans. One of the newest sights in Vanhankaupunginlahti is the nesting colony of grey herons, consisting of dozens of nesting pairs and located on a small island in the middle of the nature reserve. The range of birds found in the area is especially impressive during the spring migration – during this period you can spot a wide range of northern waterfowl and waders resting in the area, in addition to the local nesting species. One of the most sophisticated of these migratory birds is the smew, which is related to typical mergansers. The drake smew is almost completely black-and-white and boasts a stylish pattern. Another species that rests in the area in the spring is the noble-looking northern pintail. The best places for observing the migrating waterfowl are the bird watching towers of Hakalanniemi and Lammassaari as well as the rocks of Mölylä. The best time for sighting some of the area’s less common nesters, including the garganey, the northern shoveller and the gadwall, is in April. In the latter half of May, Vanhankaupunginlahti offers visitors an opportunity to observe the migration of Arctic geese, which nest in Siberia. Provided that the winds are favourable, you might see as many as tens of thousands of barnacle geese flying low towards the north-east in a single morning. Nowadays you can also spot barnacle geese in the late summer, when the geese nesting in the islands off the coast of Helsinki and Espoo start circling the area after their chicks take flight. During this period the fields of Viikki are typically grazed by thousands of barnacle geese. The grey heron has become the impressive signature bird of Vanhankaupunginlahti. It was first sighted in Loppi in 2006, when two pairs nested in the small island. Ever since then the colony has continued to grow year after year, and after ten years of nesting there were some 40 twig nests on the tops of the island’s common alders. The herons arrive at their nests as early as late March, with the males arriving first. The first arrivals take over the best nests, after which they proceed to attract females to them with their impressive dancing skills. The grey heron nests are best viewed by binoculars in the morning sunlight from the rocks of Möylä, and in the evening sunlight from the Lammassaari bird watching tower. Your best chances of seeing the colony are before the trees start sprouting leaves. The herons start incubating their eggs in early April. Each nest typically contains between two and five chicks. The chicks leave their nests after Midsummer, at which point they can already fend for themselves. After that the heron family splits up in different directions. Grey herons fish in shallow coastal waters by standing perfectly still until an unwary fish comes along, at which point the heron impales it with a sudden thrust of its beak. In addition to fish, grey herons also eat frogs, small rodents and even ducklings, if the opportunity arises. During mild, iceless winters, some grey herons remain in Helsinki over the winter – the majority, however, migrate to central Europe. The whooper swan, which is the national bird of Finland, nested in Vanhankaupunginlahti for the first time in 2014. The area had already been claimed as a nesting territory by a young pair of swans a few years prior to this, but their nesting was unsuccessful in the first two years, with the chicks most likely falling prey to predators only a few days after hatching. The whooper swan is known to be very territorial, keeping the area around its nest clear of both other whooper swans and mute swans. Territorial conflicts between the two species sometimes escalate into major fights, which the mute swan typically loses. Some mute swans have even died fighting whooper swans. The mute swan started nesting in Vanhankaupunginlahti in 1996. Nowadays there are around half a dozen pairs nesting in the area. The swans have benefited from the improvement of the bay’s water quality, as they feed on the submerged leaves of aquatic plants. The greylag goose first nested in Vanhankaupunginlahti in 2015 with two pairs. Prior to this the greylag goose was considered to be a timid, rare bird, which only nested in Helsinki’s outer archipelago. Similarly to the whooper swan, the greylag goose was hunted almost to extinction in Finland in the past. In recent years, a pair of common cranes has also been spotted in Vanhankaupunginlahti during the summers. They are expected to start nesting in the next few years. Nowadays you can also spot white-tailed eagles in Vanhankaupunginlahti all year round. In the winter, the eagles eat fish that fishermen leave on the ice, while in the summer they prey on barnacle geese and other birds. The common goldeneye, which dives for aquatic prey living on the seabed, has benefited from the improvement in the bay’s water quality. It first started nesting in the bay area’s birdhouses in the 1990s. Nowadays the common goldeneye is among the area’s most common waterfowl with a few dozen nesting pairs. The common goldeneye has a tendency to lay eggs not only in its own nest, but in the nests of neighbouring goldeneyes as well. This habit, reminiscent of cuckoos, is called intraspecific brood parasitism, and can sometimes result in common goldeneye nests containing as many as 25 eggs. However, nests with too many eggs are regularly abandoned. Another bird that nests in the bay’s large birdhouses is the common merganser. While there are only a few of these fish-eating birds nesting in the area, common mergansers are a common sight during the migration periods. In April, during the spawning season of the common smelt, you can see flocks of up to hundreds of common mergansers fishing in Vanhankaupunginlahti. The great crested grebe and the Eurasian coot make their floating nests in reed beds located near the edges of open waters, among fallen reeds that have remained in place for over a year. The nests are often destroyed by the waves and tides, but when this happens, the birds simply build new ones. In the summer, the nests are better protected by new, growing reeds. The great crested grebe feeds on fish, and has benefited from the bays large roach populations. 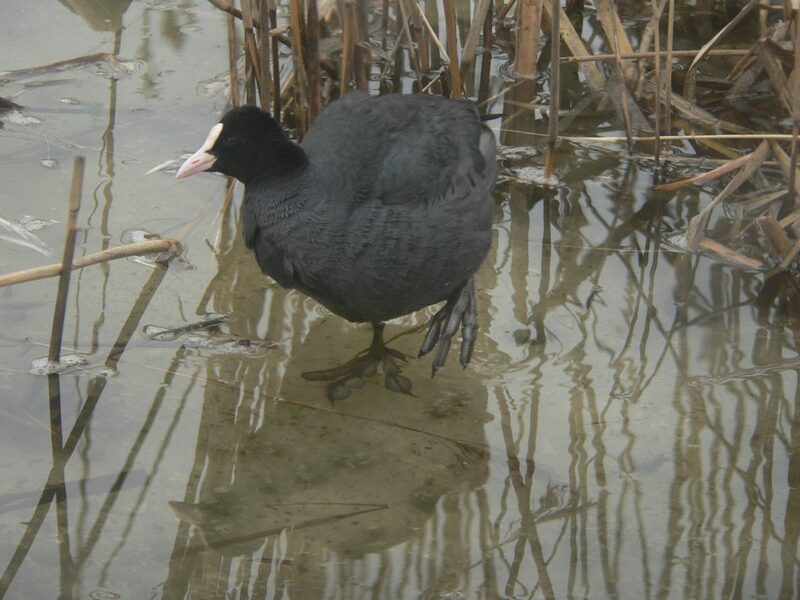 The Eurasian coot, on the other hand, dives to the seabed to feed on benthic flora and fauna. It, too, has benefited from the bay’s waters becoming clearer. Bird species that nest in the bay’s coastal meadows include the northern lapwing, the common snipe and the common redshank. Open land passeriformes that have benefited from the meadows include the western yellow wagtail, the Eurasian skylark and the meadow pipit. The extremely rare citrine wagtail has been nesting in the managed meadow on the island of Lammassaari every year since 1999. The fact that the area’s meadows are used as pastures has also made them more attractive feeding grounds for migratory birds. Meadow birds prefer open views in all directions for security. The most common alluvial shore species that visit the area during their migration include the ruff, the wood sandpiper, the common greenshank and the spotted redshank. Rarer visitors include calidrids and the bar-tailed godwit. The occurrence of waders is greatly affected by the area’s water level and the weather. When the sea water level is low, the area’s vast mud flats – the preferred feeding grounds of waders – are exposed. Strong headwinds and rainy weather also “drop” the birds to the ground to rest. During these periods you can see hundreds of waders in the coastal meadows of Vanhankaupunginlahti. The western yellow wagtail nests in Viikki in the wet meadows, where the vegetation is kept nice and short by grazing cattle. In May, the males climb on top of fence posts to sing and show off their yellow bellies. The same areas are also the preferred nesting grounds of the citrine wagtail, which is even yellower. 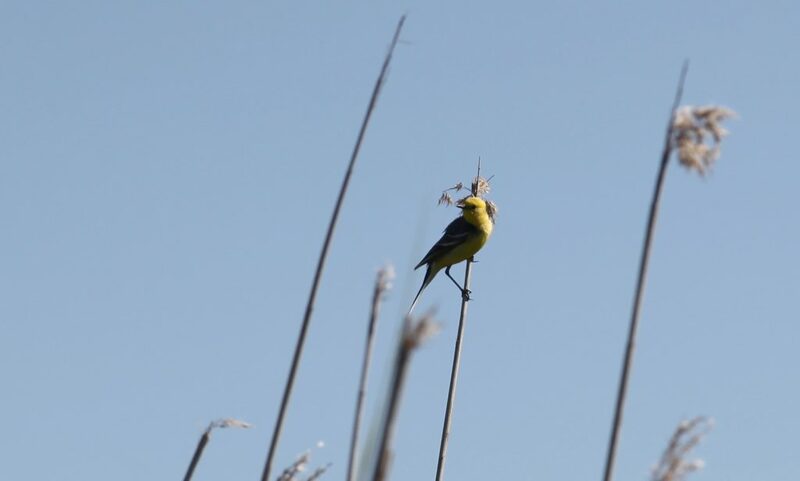 An old male citrine wagtail has a bright yellow head, whereas the western yellow wagtail’s head is dark. Citrine wagtails can be spotted from the Lammassaari and Purolahti bird watching towers. It is a new arrival in Finland, hailing from the east, and Viikki is the only place in Finland where the species has been known to nest regularly. The wood sandpiper is a “common-looking” brown wader, the existence of which many people are completely unaware of. The wood sandpiper nests in large open swamplands all over the country, but it is common only in Lapland. In Vanhankaupunginlahti, flocks of migrating wood sandpipers can be seen in May and July-August. In the spring, the species is most abundant in mid-May, which is when their call note ”jiff-jiff…” is commonly heard in the area, along with the occasional mating call ”liro-liro-liro”. During peak years, over a thousand wood sandpipers have been counted in the bay. In fact, the species is the second most prevalent wader found in the area during the migration period, after the ruff. In the autumn, the occurrence of wood sandpipers and other waders is largely dependent on the sea level. When only a few mud flats are exposed, the birds continue their migration without stopping at Vanhankaupunginlahti. By early September, the wood sandpiper becomes fairly uncommon in the area, and by the end of the month even the last birds have taken off for Africa. The northern lapwing is one the most attention-grabbing waders found in Finland, owing to its distinctive colour, calls and movements. Appearing black-and-white in colour, closer inspection reveals that the black parts of its plumage are actually a beautiful dark shade of green. The wing tips of the northern lapwing are curiously round, and during the summer its display flights are characterised by crazed tumbling, as the males fly loops in the air. During these stunt flights, you can also hear the birds’ squeaking, mewing calls. The northern lapwing nests in fields or meadows, in a modest depression on the ground. The females lay four eggs, similar to other waders. The chicks leave the nest shortly after hatching and forage for their own food with their mother. Northern lapwings often nest in clusters, with several pairs staying close together. Similar to other birds that prefer short vegetation habitats, northern lapwings arrive early in the spring, typically in early March, though some early birds may already arrive in February. Northern lapwings also start their migration away early. The males leave in June, but the females remain behind to look after their chicks. Many waders actually do the opposite, with the male remaining behind to look after the young. One such example is the Eurasian curlew, which used to nest in the fields of Viikki. A hundred years ago the only place in the Helsinki region where this “agile, fast, restless and wise bird” – as characterised by painter Magnus von Wright – nested was the meadows of Viikki Manor. At that time, the northern lapwing was just starting to spread to Finland, and its strange flying and calls attracted considerable attention. Rolf Palmgren, who was the director of Helsinki Zoo at the time, admired northern lapwings in the coastal meadows on Viikki Manor in 1913.